NYC, 04/03/2019, 7:00PM. 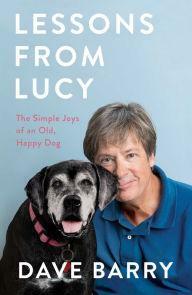 Lessons from Lucy: The Simple Joys of an Old, Happy Dog: The Lastest from Humorist Dave Barry. Faced with the obstacles of life after middle age, Dave Barry turns to his best dog, Lucy, to learn how to live his best life. Lucy teaches Dave how to live in the present, how to let go of daily grievances, and how to feel good in his own skin. Drawn from Dave's routine humiliations and accounts of the absurdities of daily life, Lucy's lessons will leave you heaving with laughter and recognition.